During the past decade, rosé wines have gone from the very low end of the wine spectrum to a place much closer to, if not the top, then the upper-middle. This is, in part, due to the overall improvement in everything in wine from viniculture to winemaking skills and techniques across the industry. As a result of these developments, almost all wines, especially mid-range and lower end wines, have improved. But rosé has gotten even better, because some great winemakers have begun to produce rosés, especially in California and Oregon. Provence, the recognized king of rosé regions, has also upped their game. The result is a much higher quality set of options for summer wine drinking – or any time that you would like to enjoy a nice, light, crisp and, increasingly, complex wine. As noted in the earlier post on Go-To White Wines for Summer, Dorianne and I tend to reverse our normal ration of 75% reds to 25% whites and rosés in the summertime. We drink fewer reds and those tend to be lighter reds (we may even serve them chilled a bit). 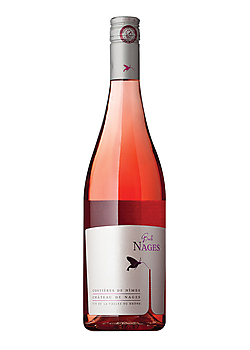 Chateau de Nages Buti Nages Nimes Rosé (2012) purchased from Total Wine and Spirits ($9.99) and King Estate Acrobat Rosé (2013) purchased from World Market ($11.99). Both of these wines are crisp and dry, fruit-forward wines. The Chateau de Nages is from the Rhone Valley and is 60/40 Grenache/Syrah aged in oak barrels. The Acrobat is a Pinot Noir and is aged in stainless steel. A little higher up the price spectrum is a wine that I have had several times over the past decade, but is not available every year, at least not where I have looked. The wine is Turkey Flat Rosé from the Barossa Valley in Australia. The grape is Shiraz and the wine is always dry and crisp with some minerality enhancement to the fruit that one expects from a rosé. As always, I recommend that you explore around your local wine shops and other retailers and see what rosés they are stocking. Have a conversation with the folks in the shop to see what they recommend based on what you like. I have found some interesting wines this year, including a Cabernet Sauvignon rosé from South Africa. There are also some very well-crafted California rosés this year – but at higher price points than the French rosés, including Provence, Bordeaux, and the Rhone and Loire Valleys. I found a great Rosé recently at Target. Nice balanced flavor.